Muhammadu Buhari who arrived today at Washington DC to meet with President Barack Obama and about 60 other world leaders and heads of international organizations at the 4th Nuclear Security Summit is about to be welcomed by very furious Biafrans. Biafrans are waiting for Buhari at the venue of the Nuclear Summit. Information reaching Family Writers said Buhari is afraid to come out from his hotel room. 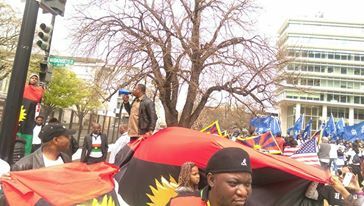 Biafrans are contemplating on heading to MANDARIN ORIENTAL HOTEL to confront him. Buhari who is hiding at his lodge at MANDARIN ORIENTAL HOTEL, is scared of been confronted by angry Biafrans. We are going to pursue them to the end of the earth. There will be no hiding place for killers of Biafrans. They don't know who we are, do they?? This is just the begining. VERY INTERESTING SHOW. THIS BIAFRANS ARE COURAGEOUS O! THOUGHT THEY COULD ONLY CONFRONT GOVERNOR OKORAOCHA, BUT IS LIKE PRESIDENT BUHARI IS IN TROUBLE O! Buhari must be disgrace on the arrival to the USA soil. Biafrans in the USA must all come out and confront him, tell him that his evil doing is enough. He refused to watch the clip of his zombies killing the innocent unarmed biafrans during his interviewed on Ajazeera TV. That is to show the world that Buhari is an evil man. ...KILLING AND INCARCERATING BIAFRANS IN BIAFRA LAND, AND GO INTO HIDEOUT WHEN BIAFRANS CONFRONT THEM IN FOREIGN COUNTRIES!WE SHALL KEEP CONFRONTING THEM WITH TRUTH,AND THE WEAPON OF TRUTH SHALL DESTROY ALL OF THEM!ALL HAIL BIAFRA!